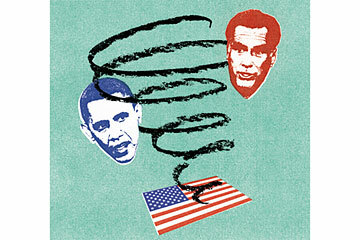 Barack Obama's inspirational whoosh to the presidency in 2008 was unusual. Most campaigns are less exhilarating; indeed, they are downright disappointing--until someone wins. Then, suddenly, it becomes "clear" that one candidate magically understood and responded to the needs of the electorate and that his team of strategists were, ahem, geniuses. But in the days just before a closely contested election like this one, the missed opportunities and tactical blunders seem painfully obvious on both sides. The pettiness and lack of substance are suffocating. Has this year been particularly awful? It certainly seems so now, especially as the devastating truth of Hurricane Sandy beggars a campaign in which major issues like climate change were either ignored or denied by both sides. It does seem hard to imagine a national celebration of either a Romney or an Obama victory. The President has run a tactical, largely negative campaign, more concerned with Romney's weaknesses than with the strength of his own record. It is almost as if his victories--with the exception of Osama bin Laden's death and the auto bailout--were too technical or abstract to explain. His various economic moves in early 2009 prevented another Great Depression, but on the advice of his consultants, Obama isn't even using the word stimulus anymore because it's too controversial. His health care plan represented not just a moral step forward but also a path to lower prices--especially for small businesses--and a reform of a wasteful medical system, but it hasn't been implemented yet, and it has been demagogued to near death by the Republicans. In fact, the President has bought the basic Republican assumption: that the public loathes government action. This has severely limited his ability to talk about his plans for the next four years, even though the libertarian trope is a delusion easily refuted. The federal response to the hurricane is Exhibit A; just ask New Jersey Governor Chris Christie. And Obama's failure, or unwillingness, to make the case for his essentially moderate vision of governance has raised major questions about his continuing ability to lead the nation. Mitt Romney hasn't made much of a case for himself either, and his quick-change policy reversals, false claims and false advertising raise serious questions about whether he has the character and constancy to be President. In the week before the election, he put up an insultingly false ad about the President's record on the auto bailout. He claimed that Obama had "sold Chrysler to Italians" who were sending Jeep jobs to China. Chrysler immediately repudiated this. The truth is, Chrysler is adding Jeep jobs in the U.S. and, given its resurgence here, may boost Jeep production in China for Chinese consumption. This sort of ad seems particularly galling given the fact that Romney opposed the auto bailout and has spent his whole business career embedded in the global economy, selling companies to the "Italians," or whomever, so that they could send jobs to "China," or wherever. It is rare to find a candidate so willing to repudiate his life's work.